This thing, this bicycle shaped object, this…don’t make us call it a bike. It has been invented. Not only has Pandora’s Box been opened, but people of the world are supporting its growth from twinkle in the eye of an inventor, to a real life trail riding entity. It hurts our eyes, it hurts our souls. 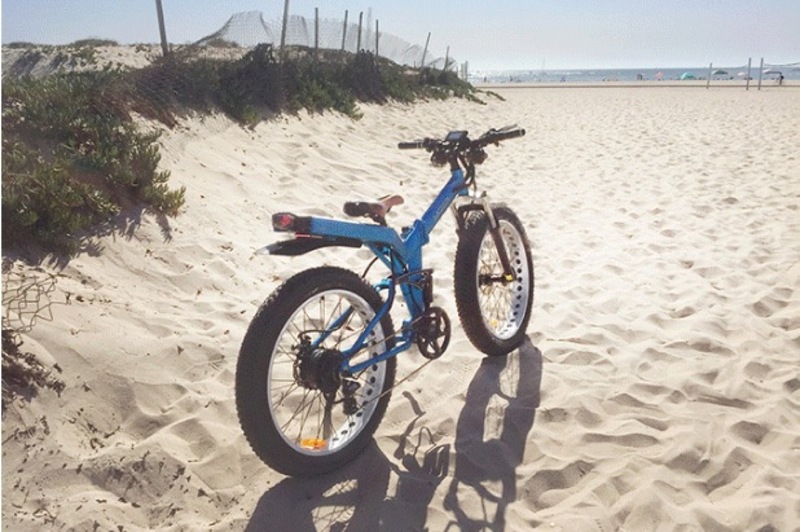 It is the Fat Tyre Folding Electric Bicycle. The FT-FEB? 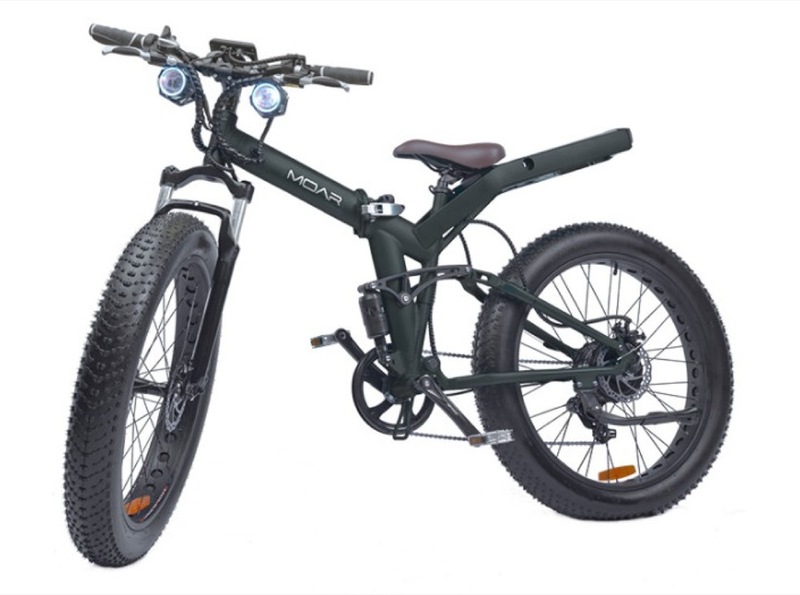 No, it’s called the MOAR (MOAR vroom, MOAR more, MOAR argh), which its makers claim ‘is the only folding, full suspension, fat-tire eBike on the market’. So that’s some relief then. Zero upgrades? We’ve never previously considered a hacksaw and hinges as an upgrade, but hey, this means you don’t need to worry about that possibility any more. Actually, a hacksaw might not be a bad idea. Or an angle grinder. Or one of those metal recycling industrial shredders. It comes with an electric motor, activated not by pedalling, but by a throttle. The site boasts: ‘At 118ft-lb (160NM) of max torque, our 750w mid-drive motor can tow a SUV from a standstill and has more than enough power to conquer even the steepest hills’. The ability to tow an SUV has never entered our heads as being a desirable trait of a bike. That’s BECAUSE IT’S NOT. Bikes should not tow SUVs. Bikes do not tow SUVs. This is not a bike, it is a bicycle shaped object of the sort that gives actual bikes and e-bikes a bad name. Actual e-bikes, pedal assist versions, are (we think) a good thing – a way to get people off their sofas, keep people riding for longer, and allow access to trails they might not otherwise reach. Things like this creation make it harder to argue for a sensible stance on pedal assist bikes. Additional ‘upgrades’ built in include 1000 lumen ‘headlights’, brake lights, ‘turn signals’, and horn. Forgive us a moment, but THIS IS NOT A BIKE. It’s a car, with two wheels and the roof removed. And hinges added. Which we suppose does mean you might fit in quite small parking spaces. But that’s where it should stay: on the road, on the tarmac, and probably with a licence. Its makers are unapologetic. Here’s some rationale behind this thing: An ebike goes almost as fast as a scooter, up to 20mph easily (speed limited by state law). The speed is exhilarating but also turns every bump, pothole and imperfections on the road into bone jarring jolts, even for a fat-bike. We have decided at this speed a full-suspension bike is the only way to go. Is this really the only way to go? 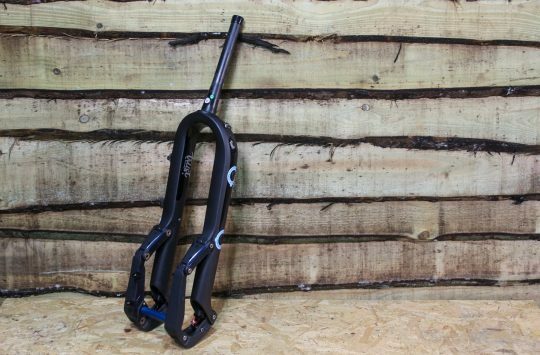 Is it an inevitable variation on pedal assist e-bikes? 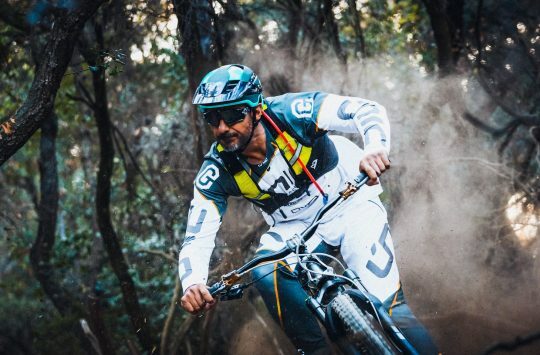 A clouding of the picture for those who seek to distinguish MTB riders from Motocross riders? Or a real and genuine alternative to the car that we should welcome with open arms because anything is better than another car? What do you think? We’re off to bleach our eyes. On a positive note, it could feature on the Argh! My Eye thread. Why bother with pedals at all? They could ditch them and just power it from the motor. A “motor-bike” if you will. It is an electric motorbike. How heavy is it? There’s not a lot of point in being to fold it if you can’t pick it up. This is why nobody has invented the folding polar bear, folding grand piano or folding submarine. @HtS about 70lb depending on which battery you go for. Best not have to run for a train while carrying it! So much ugly, kill it with fire and then nuke it from space to be certain. Comes with a free truss? 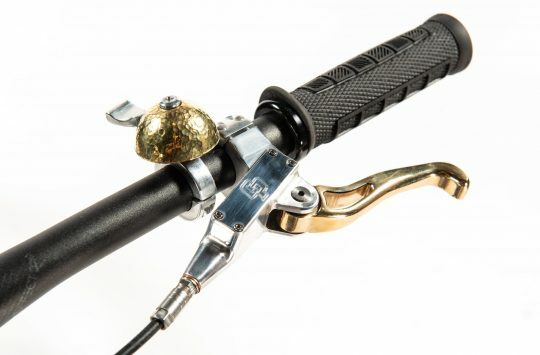 …and a kick stand. You wouldn’t want to lay it on the floor though. According to the company web site, British powertrain guru Paul Lynch is the man behind the motors..reassuringly he is quoted on this link below as ‘Paul now sells on his website and was powered by 2 experimental geared hub motors. The front motor is 2000 (thousand) watt and the rear was a 4000 watt. This thing is scary fast and can easily exceed 45 mph.” so nothing to worry about future direction of travel for the industry….that is the electric motor bike industry. It’s attracted over 1000% of its initial funding bid. Mental.